The 5th in the Me & U2 series, Sandro Olivo catches up with Peter Nigido, probably the only kid in grade 3 who loved U2. 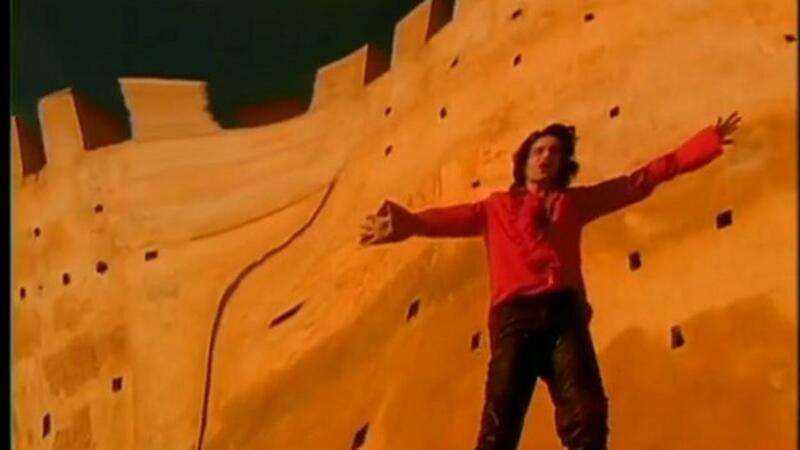 Bono in the Mysterious Ways film clip that first got Peter Nigido hooked on U2. I remember the day I first watched the video for Mysterious Ways during its release on Australian TV. I was in primary school and remember thinking ‘Wow, that guy in the red shirt is so cool. This song is awesome’. It really was love at first sight. My older siblings had been following U2 from their earlier releases and explained to me that those songs and albums I enjoyed listening to with them were recorded by the same guys I was watching at that moment on TV. I was too young to make the connection at first, as the band’s shift in sound and image had changed dramatically. Though once the realisation kicked in, I was in awe. I became a solid fan and the only kid in grade 3, and most likely my school, that loved U2. From that point, following them became a way of life..
February 21, 1998, at Waverley Park. It was the PopMart Tour. I was too young to go to Zoo TV. You were the first drummer in The U2 Show – Achtung Baby tribute band. How did the band start? In my late teens/early 20s I remember looking for bands to join and decided to look at some ‘Drummer Wanted’ ads that were going in Melbourne’s Beat magazine. I came across an ad that the founding member Peter Kalamaras (The Edge) had put up. He was looking for a drummer and vocalist to join a U2 tribute act. At first I was a little hesitant to audition. At that point in life, I was looking to join an original band, however being U2 and already knowing all of Larry’s drum parts to every song, I convinced myself to have a shot at it. I think I was with the band for about a year or so and played a few shows around Melbourne. It was great hanging out with those guys – a bunch of passionate U2 fans playing U2’s music. One thing I loved was challenging each other on who knew what parts to different versions to different songs. It was truly exciting. My desire to play music and express myself within an original act was the reason I didn’t pursue it. What’s your favourite U2 song to play drums on and why? It’s so hard to choose one favourite song so I’m going to have to give you two, both on equal par. Acrobat from Achtung Baby. This song has a driving rhythm section from the get go. It’s not too technical to play, however it demands energy and tribal dynamics. In my opinion it’s Larry Mullen Jr at his best. Please from the Pop album. That beat oozes with feel and groove. It has a sweet snare roll at the start of every down beat and some nice breathy (high) hats that complement Adam’s bass line. Larry’s groove in this song has such a mature and disciplined approach to it. The concept to his performance gives the sense of military texture fused with funk. It truly locks in with a soulful walking bass line. Again, in my opinion, this is U2’s musicianship at its finest. I really enjoy watching older footage of the band playing this live. Within the bridge and throughout the ending of the song, Larry introduces the very recognisable Sunday Bloody Sunday beat into it. I believe it’s relevant and effective to the emotion. We know U2 have another album, titled Songs of Experience, that will be released soon (rumours are September this year). What are you hoping for? First, I put expectation before hope. I expect pure honesty within the writing. The energy and content of the album must come from an honest place. Being called Songs of Experience, I’m kind of expecting to be blown off my feet. What I’m hoping for is a darker album, being darker lyrically and sonically. I hope it’s not rushed or commercially overkilled. I tend to enjoy the arty side of U2, the ambitious and alternative U2. As a fan, and in my opinion, I recognise that at times the lads can get a little complacent. I hope there is none of that on this new record. I want it to be all heart. For my 21st birthday, I was given a snare drum skin that belonged to Larry. For some reason, it’s signed by Bono. He also drew a cartoon-like pic of himself wearing his famous shades on it too. I also own the original collector’s edition vinyl of the Under a Blood Red Sky album. The vinyl was made red, not your traditional black. That was given to me by my cousin so both items hold sentimental value. 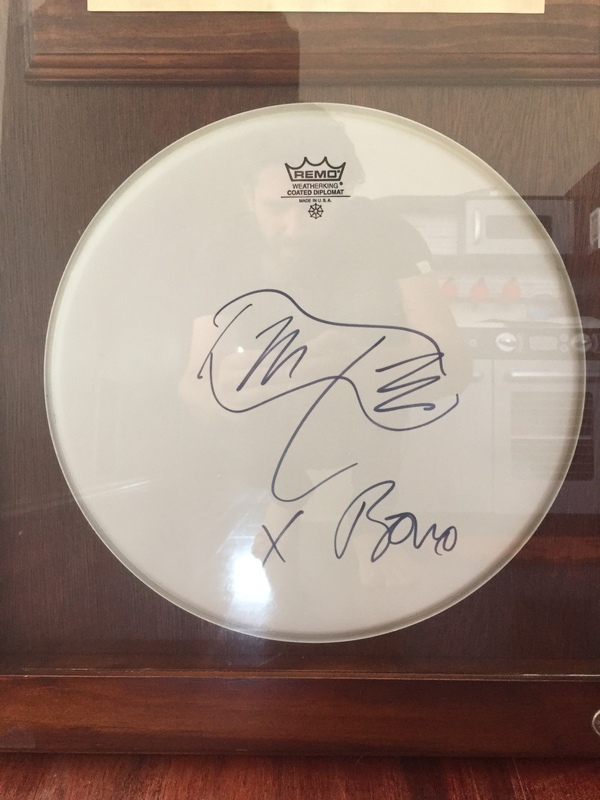 Larry’s drum skin signed by Bono. Too hard to pick a number one favourite song. I wish I didn’t get asked this question as I feel I’m letting other great songs down for not picking them. If I really have to choose, it would be Ultra Violet (Light My Way). Reason being that it was the very first song I attempted playing drums to using mum’s wooden spoons, a couple of phone books and kitchen chairs as my drum kit set up. Because of this impressionable reason, I call this song my favourite. It also has a killer vocal intro, Bono’s falsetto gives me goose bumps every time. Pop. It shaped the person I am today. In my early teens I lived and breathed that record. Besides the opening song Discotheque, which I’m not the biggest fan of, the rest of the album isn’t Pop music, and that’s what I love about it. The album is artistically ambitious and morally contradicting. I can go on and on about my love for it.